The patient is a 42-year-old female, I am going to call her Mary for the purpose of the article. Mary is a devoted mother of three and has worked hard as a clerical officer for over twenty years. She had no major surgeries but has been suffering from chronic pain, sleep disruption, headaches, fatigue, and fibromyalgia for four years. This has greatly impacted her quality of life and left her feeling tired and frustrated. She has a list of prescription medicine to help her get through the day. To get a diagnosis of fibromyalgia is actually quite difficult as there is no specific test or protocol to follow. The condition is complex and has so many variables. However, there are general guidelines to follow and these were published by the American College of Rheumatology. The guidelines suggest that a person with a history of widespread chronic pain for over three months, as well as associated symptoms of fibromyalgia, will merit further investigation. On examination, the person will have decreased tolerance to pressure in eleven specific areas of the body. This is seen as adequate information to warrant a diagnosis of fibromyalgia. Mary's main areas of pain are as follows: Feet, knees, hips and lower back, neck pain with headaches and sometimes burning in the hands. That is a very common list with fibromyalgia clients the key thing we need to identify is which areas are causing the majority of pain - I like to call them "the trigger muscles". The initial treatment is a light flush massage that allows sufficient feedback to the clinician, of the areas of hypersensitivity causing pain and discomfort. A light Flush massage will allow the client to understand which areas relieve quicker and in turn, they then understand their individual problem area. Follow up is within three days; this is because most people with fibromyalgia will generally look for treatment during a fibro flare. During a flare, all symptoms of fibromyalgia will spike. It is crucial to get that follow up treatment early, as the initial treatment may aggravate symptoms if left too long! This is why the initial treatment is a light flush massage rather than a deep tissue massage. It is also important to understand that the body may not like change; change is always good whether it is positive or negative. The key is working towards that positive change. The treatment at this stage includes a deep tissue massage and trigger point release followed by a light flush. Trigger release therapy was especially needed for this particular case as her upper shoulder and neck region muscular tissue was carrying a lot of tension. The tension in this region can cause intensive headaches. Mary’s symptoms of pain, in general, have subsided slightly from the last session but headache’s had intensified. The most important thing for this session is to releases her neck muscles, the sub occipitals in particular. These muscles are located at the base of the skull. Pressing on these tension points will mimic the symptoms of a headache. 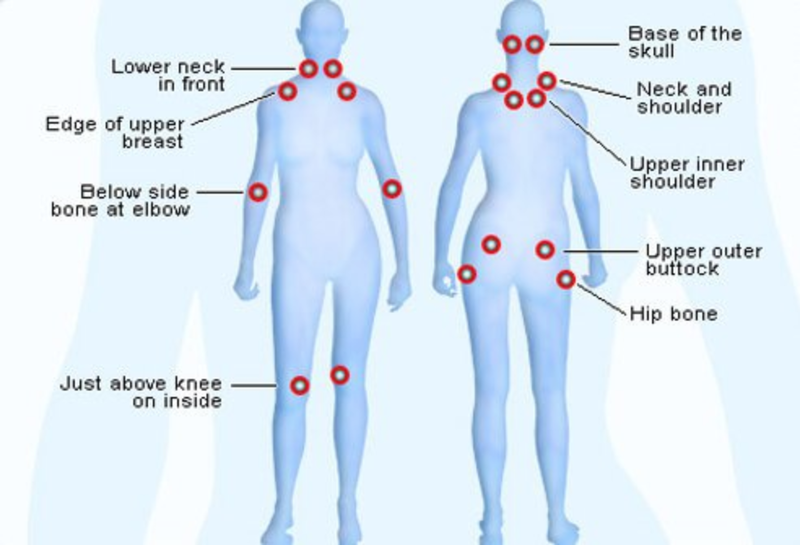 It can be a tricky process as these points can be quite hypersensitive due to the fibromyalgia. I gave Mary specific breathing exercise to help with her posture. Depending on the findings, other modalities can be used in the treatment of Fibromyalgia. I have also used passive and active release techniques as well as dry needling. Sometimes, it is beneficial to have other treatment options to target those stubborn tension points. On this session, her fibro flare has subsided and sleep has improved. Mary is getting out for a walk twice a week and doing her prescribed exercise every night. A headache is still persisting but not feeling as intense. This session was a deep tissue massage to maintain the changes. With the symptoms subsiding Mary is now able for more complex exercise to help resolve her headaches and regain control. Mary was in great form today, no headaches since the last session. A Little bit of stiffness in her upper back from the exercise but greatly improved. The appointment from here on out was pushed out to a week apart. Not every week has been as good as this but she has regained control of her life and is in a better place. The management is all down understanding what is going on and letting someone else solve the issues for you. With Mary, she took the step in coming to me and asking my advice on how she would improve and I was able to guide her in the right direction. The first step is to understand that it is going to be a tough three weeks to get this routine nailed down, especially if you are going through a fibro flare. The key is to get regular massages to treat those tender points, so many people give up and don't understand the importance of sticking to a plan. Get professional advice, stick to the plan, regain control.